After the success of 1998's Saving Private Ryan, Tom Hanks & Steven Spielberg teamed up again to produce the ambitious WWII TV miniseries Band of Brothers in 2001. 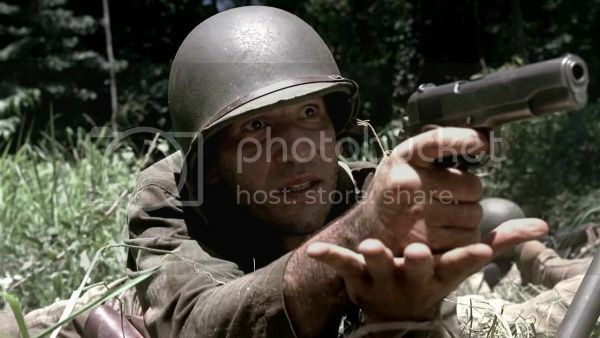 The series was like Private Ryan on 'roids, and won a bunch of awards, including 6 Emmys and one Golden Globe. It also spawned a follow-up of sorts in 2010's The Pacific, which was just as awesome. It's a fantastic series, and it's easy to forget it came out over ten years ago. A recent re-watch shocked me when I saw how many familiar faces were in it. Actors that we take for granted as part of our entertainment lives these days were just in the early part of their careers when they took their roles as the men of the US Army's Easy Company. We're going to have a look at three of my favourite re-discoveries, which was a tough list to whittle down. I won't be looking at David Schwimmer, because he was already famous before Band of Brothers, and I also won't be looking at Damien Lewis because, c'mon, he was the main guy. 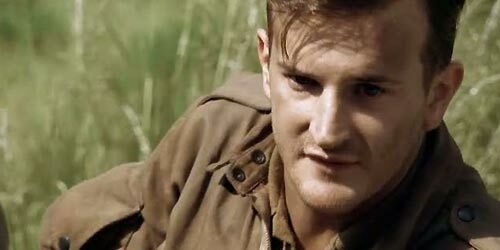 If you've forgotten he was in Band of Brothers I'd question if we were watching the same show! Join me below the cut for a flash-back to 2001. 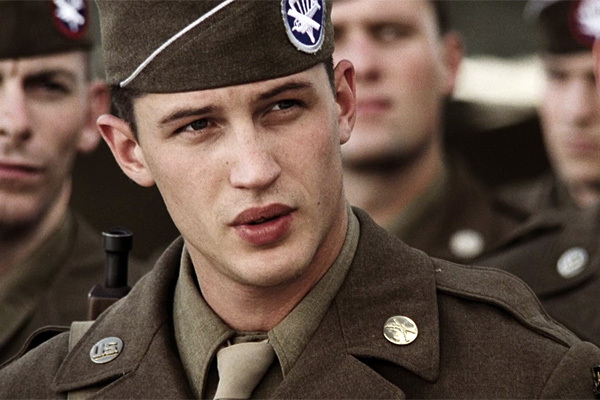 Before he was Gotham's Reckoning, a fresh-faced Tom Hardy was Private First Class John Janovec. 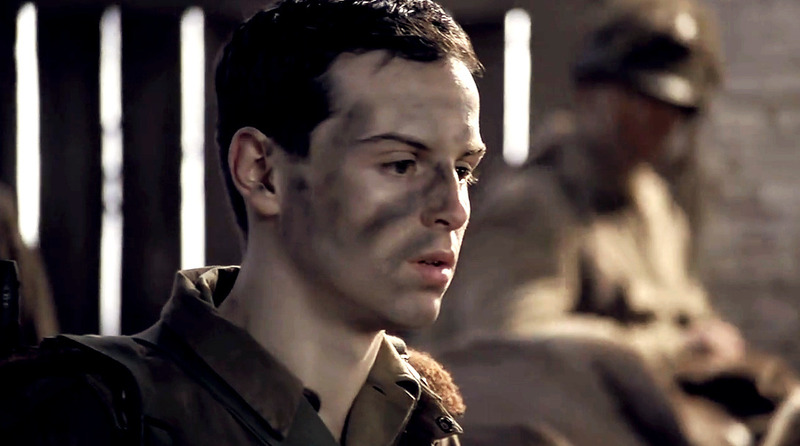 Look at how handsome he is in that damn uniform. He appears in the final two episodes of the series, 'Why We Fight' and 'Points', and while he does get up to a bit of mischief, he will probably just be remembered as the guy who died AFTER the Germans surrendered and everyone was buddies. If I was him I'd feel a little ripped off about being in a World War II epic but then meeting my maker when my jeep runs off the road. Damn. 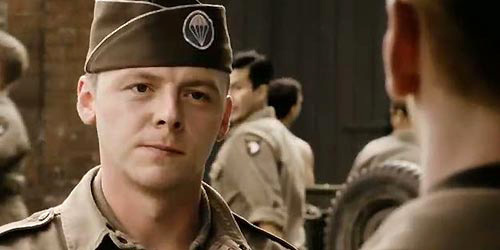 Despite looking like a 15 year old during his short Band of Brothers stint, Simon Pegg was actually 31 at the time. There's having a baby face, and then there's THAT. William Evans appears in the first two episodes as David Schwimmer's mostly silent offsider, glowering in the background as his boss rants at the guy from Homeland about a tin of peaches. I think he literally had one line in his whole two episodes, in which he gave the guy from Homeland his court marshall papers. On the plus side, he doesn't die! UNF! 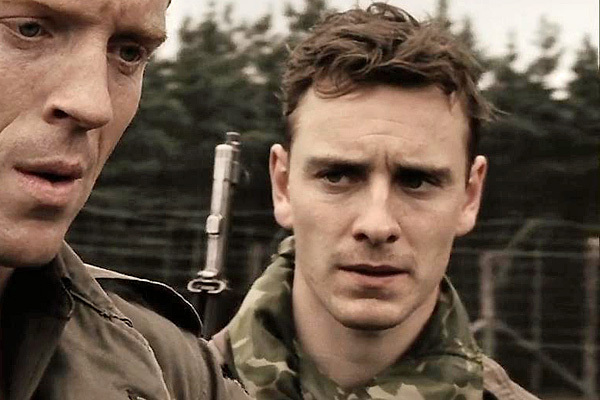 A 24 year old Michael Fassbender starts off at boot camp looking for all the world like a gangly-legged baby giraffe who is all arms and legs and had me thinking 'Geez, lucky he grew into his looks'. But as the series went on and our paratroopers got down and dirty he turned into the furrowed-brow badass we all know and love. One of his first scenes involved him being yelled at by Ross from Friends over having an empty water canteen, so I'm sure he's extremely proud of that. He appears in 7 episodes all together, and does make it to the final episode 'Points' though I didn't quite get that far in my re-watch session so I can't quite remember what fate befell him. Fassy's X-men buddy James McAvoy also makes a brief appearance, though he only lasts one episode before leaving a good-looking corpse. This thing is almost as bad as Game of Thrones; everyone dies. Other faces that you might recognise include Jamie Bamber ('Apollo' in Battlestar Galactica), Richard Speight Jr ('Gabriel' in Supernatural), Andrew Scott ('Moriarty' in BBC Sherlock), and Kirk Acevedo ('Charlie' in Fringe). John Bernthal ('Shane' in The Walking Dead) pops up in The Pacific, as does James Badge Dale ('Explodey super soldier guy who stole the Iron Patriot suit' in Iron Man 3). 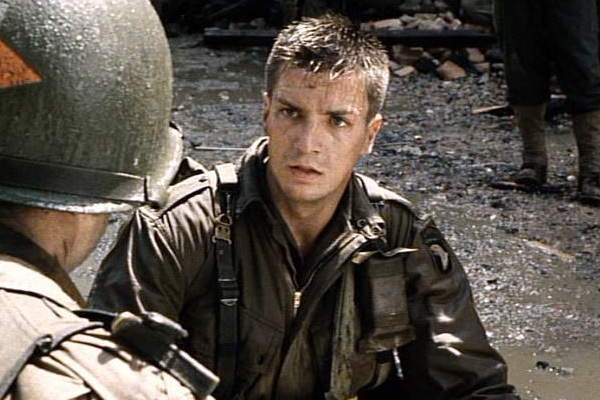 But as far as unexpected cameos go, I simply can't go past the one that inspired this post in a roundabout way....Nathan Fillion in Saving Private Ryan.